The county of Tripoli in what is now North Lebanon is arguably the most neglected of the so-called ‘crusader states’ established in the Middle East at the beginning of the twelfth century. The present work is the first monograph on the county to be published in English, and the first in any western language since 1945. What little has been written on the subject previously has focused upon the European ancestry of the counts of Tripoli: a specifically Southern French heritage inherited from the famous crusader Raymond IV of Saint-Gilles. Kevin Lewis argues that past historians have at once exaggerated the political importance of the counts’ French descent and ignored the more compelling signs of its cultural impact, highlighting poetry composed by troubadours in Occitan at Tripoli’s court. For Lewis, however, even this belies a deeper understanding of the processes that shaped the county. What emerges is an intriguing portrait of the county in which its rulers struggled to exert their power over Lebanon in the face of this region’s insurmountable geographical forces and its sometimes bewildering, always beguiling diversity of religions, languages and cultures. 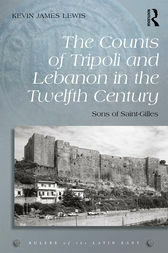 The counts of Tripoli and contemporary Muslim onlookers certainly viewed the dynasty as sons of Saint-Gilles, but the county’s administration relied upon Arabic, its stability upon the mixed loyalties of its local inhabitants, and its very existence upon the rugged mountains that cradled it. This book challenges prevailing knowledge of this little-known crusader state and by extension the medieval Middle East as a whole. Kevin James Lewis completed a doctorate in History at the University of Oxford, where he produced a thesis on aspects of the ‘crusader’ county of Tripoli during the twelfth century, under the supervision of Professor Christopher Tyerman. Previously he studied at Cardiff University’s Centre for the Crusades, taught by Professors Helen Nicholson, Peter Edbury and Denys Pringle. More recently he held a Past & Present Postdoctoral Fellowship at the Institute of Historical Research, University of London.